A comic novel is usually a work of fiction in which the writer seeks to amuse the reader, sometimes with subtlety and as part of a carefully woven narrative, sometimes above all other considerations. It could indeed be said that comedy fiction is literary work that aims primarily to provoke laughter, but this isn’t always as obvious as it first may seem. Larry was just your regular caribou, who was cruelly excluded from his crew. He and his kin happened to be the sole Jewish reindeer in the North Pole. Larry was bullied and treated the worst way, until his plan saved one Christmas Day. A contemporary satirical take on Rudolph the Red Nosed Reindeer, Schmuck the Buck introduces Larry, a young Jewish reindeer. He overcomes his awkward and sometimes painful youth to save Christmas. His tale of acceptance and inclusion is sure to warm the hearts of anyone who loves Christmas, Hanukkah, or both. Sixty pages of vibrant illustrations bring his story to life. A unique modern addition to any holiday library. I received this book from author for a review. All opinions are my own. A darkly funny and spectacularly original exploration of friendship, goodbyes—and spontaneous combustion. Whip-smart and blunt, Mara narrates the end of their world as she knows it while trying to make it to graduation in one piece. It’s an explosive year punctuated by romance, quarantine, lifelong friendship, hallucinogenic mushrooms, bloggers, ice cream trucks, “Snooze Button™,” Bon Jovi, and the filthiest language you’ve ever heard from the President of the United States. Aaron Starmer rewrites the rulebook with Spontaneous. But beneath the outrageous is a ridiculously funny, super honest, and truly moving exemplar of the absurd and raw truths of being a teenager in the 21st century . . . and the heartache of saying goodbye. Title: Born a Crime: A stories from a South African childhood. 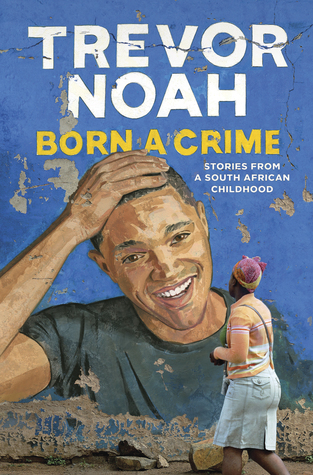 Born a Crime is the story of a mischievous young boy who grows into a restless young man as he struggles to find himself in a world where he was never supposed to exist. It is also the story of that young man’s relationship with his fearless, rebellious, and fervently religious mother: his teammate, a woman determined to save her son from the cycle of poverty, violence, and abuse that would ultimately threaten her own life. I really like Trevor Noah in The Daily Show. And I really like memoir audiobooks narrated by the author. So this book was just a perfect pick for me. Trevor shares with us an amazing story of childhood so much different than anything I know. He was born in South Africa when interracial relationships were illegal, but his mother was fearless and she wanted a child. She asked her white friend for that child. She was relentless so she got that child. So Trevor was born into a black family, but he was coloured. He wasn’t black and he wasn’t white. And at that time how you looked and what colour your skin was crucial. The whole system was based on that. There were towns where black people lived, where white people lived, coloured, Indian, Asian. How you lived and what you were allowed to do was based on how you were classified racially. The story of Trevor’s childhood is centred around his mother. She is the true hero of his story and we learn so much about her. Trevor tells us about tough choices she had to make, about her stubbornness and fearlessness. She’s truly amazing women, and it was thought to listen to what happened to her at some time in her life. She’s extremely strong. You can learn a lot while reading this book. It tells a story of life in the aftermath of apartheid. It shows us how hard it is to judge someone who committed a crime. How unjust world is. But the story also has its light moments. It’s not all serious. Trevor’s mother lessons about women and romance are very good. Stories of Trevor’s romantic endeavours are quite funny, cute and a bit sad. Fantastic collection of comic strips. Each of them will make you chuckle, and at the same time will make you realize that the world can be a lonely and cruel place, and some of those strips are coming from a somber place. But dealing with this sadness with those comics strips will brighten your day. I wanted to share so many of those comics strips with my friends, because they say something that I cannot say, but I feel and understand. I rarely choose a typical chick-lit with a woman chasing a man as my read. I prefer to watch romantic comedies, not read them. But the blurb said that this is a great book for fans of Broad City and Bridget Jones, so I decided to give it a try. And I stand with my initial preferences – I’d rather watch a 1.5h movie with the same plot than read the book. But I still quite enjoyed reading the book, so I gave it three stars – it’s not bad, and it’s not great, and I’ll probably forget all about it soon.